uses available toxicological and ecological information to estimate the probability of occurrence for a specified unde-sired ecological event or endpoint. The level for these endpoints depends on the objectives and the constraints imposed upon the risk assessment process; therefore, multiple endpoints at different scales may be necessary. ERAs often rely on the link between these undesired endpoints to a threshold of exposure to specific toxicants and toxicant mixtures. Oral reference doses (RfD), inhalation reference concentrations (RfC), and carcinogenicity assessments are the usual way these links are expressed in the ERA, and unfortunately most of these thresholds have been developed for human health assessments and not ecosystem integrity. However, since these studies often use animal models, in many cases the original empirical data can be used when trying to apply these findings to ecological consequences or to establish ecological screening values (ESVs). The ecological exposure assessment often begins by comparing constituent concentrations in media (surface water, sediment, soil) to ESVs. The ESVs are derived from ecologically relevant criteria and standards. For example, in the United States the United States Environmental Protection Agency (USEPA) Screening Values and National Ambient Water Quality Criteria (NAWQC) are often used based on 'no observed adverse effect levels' (NOAELs) or 'lowest observed adverse effect levels' (LOAELs) derived from literature to assess exposure. Radionuclide comparisons for ecological screening are typically dose-based for population level effects. In addition to the ecological threshold comparison, constituents that may bioaccumulate/bioconcentrate are identified during initial screening processes. This is done to account for toxicants that may not be present at levels exceeding ESVs, but must be considered due to trophic transfer of toxicants that may concentrate in higher-trophic-level organisms. Constituents that exceed ESV comparisons (present with means, maximums, or 95% upper confidence levels (UCLs)) are evaluated using a lines-of-evidence approach based on (1) a background evaluation, (2) a bioaccumulation/ bioconcentration potential and ecotoxicity evaluation, (3) a frequency and pattern-of-exceedances evaluation based on review of exceedances to the ESVs, and (4) an evaluation of existing biological data. From this information, ecosystems can be prioritized in terms of risk and focused for proper exposure assessments. 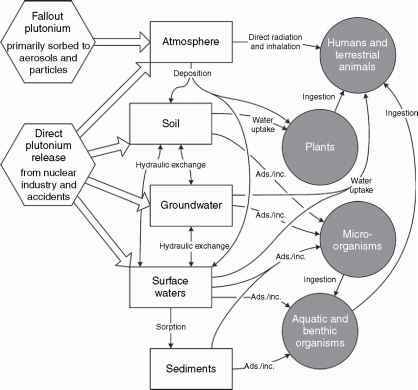 This article presents a scientific overview and review of how toxicant exposure is estimated and applied to assess ecosystem integrity.